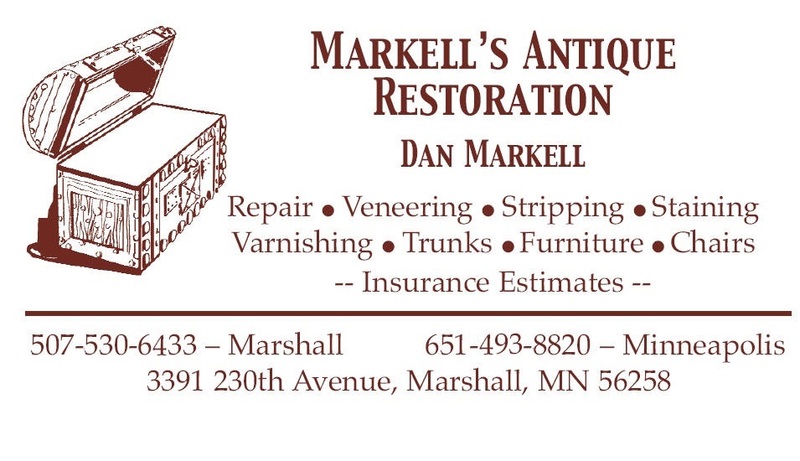 Markell Antique Restoration has been established in the Marshall, MN area for over 20 years. We have over 40 years of specialized working knowledge and antique restoration expertise. We have three locations to serve with the home base located in Marshall MN and two satellite locations; Minneapolis MN and the greater Tampa FL area. We have a wide customer base comprised of individuals and Antique Dealers. We offer a full service restoration shop including: stripping, staining, varnishing, and veneering . Projects that are missing pieces, spindles, drawers and doors, etc. can usually be restored to their original condition. Trunks are one of the specialty items here at Markell's. Most any trunk can be brought up to display or like new condition after a short stay in our facilities. A refinished trunk looks great in a den, bedroom or living room. Your trunk may need only to have handles replaced or require a complete make over, complete with cedar or vintage wallpapered interiors. We also enjoy challenges: roll tops, commodes, dressers, etc. Furniture can be picked and delivered apon request.